Friday Dec. 21st at 12pm was the official closing time for our Xmas Pre-Order Menu. We will have LOTS of products available in both stores all weekend long and up until Dec. 24th at 3pm. Please make sure that if you are picking up your pre-order on Monday the 24th, you are here before 3pm. Pre-orders allow you to plan and place your Christmas order now, in advance of a specific pick-up date which is close to Christmas Day. The pick-up dates are listed below. CAN I BUY THESE PRODUCTS NOW? Yes! Everything you see on our Christmas and Holiday Menu is available for purchase throughout the month of December. You can buy most of these items in store, but if you want one of the larger items (like a cake or a 9.5” Tart), you need to call the store. - Pre-orders may be placed ONLINE, in store or by phone. We do not accept email orders. - We stop taking Christmas Pre-Orders at 12pm on Friday, Dec. 21 at 12pm. - All pre-orders will be available for pick-up from 10am through to close on your selected pick-up date. Pre-order cancellations will be accepted up until Friday, Dec. 21st at 12pm. After this date and time, pre-orders are non-refundable. IF YOU MISS THE PRE-ORDER CUT OFF DATE: Fear not! We will be making extras of everything to be sold from both locations on a first come, first serve basis. Please head to the store nearest you early in the day to ensure the best available selection. Below you’ll find a list of all the amazing treats and savouries we’re offering daily throughout December and as a Pre-Order for the week leading up to Christmas Day. If you want to place an order for any of these items, please visit the ORDER ONLINE section of our website. Nanaimo Cake - Layers of moist chocolate cake infused with coconut and frosted with a thick spread of Bunner's creamy custard flavoured frosting. Topped with our decadent chocolate ganache and a sprinkle of toasted coconut. Cranberry Clementine Cake - When you cut into this cake and pull out the first slice expect to hear a lot of oooh's and ahhhh's! With it's tasteful and deceptively understated exterior, this cake is an explosion of colour and taste on the inside - like, major jazz hands! Whole cranberries and a delightful clementine curd infuse this tender three layer, premium cake. 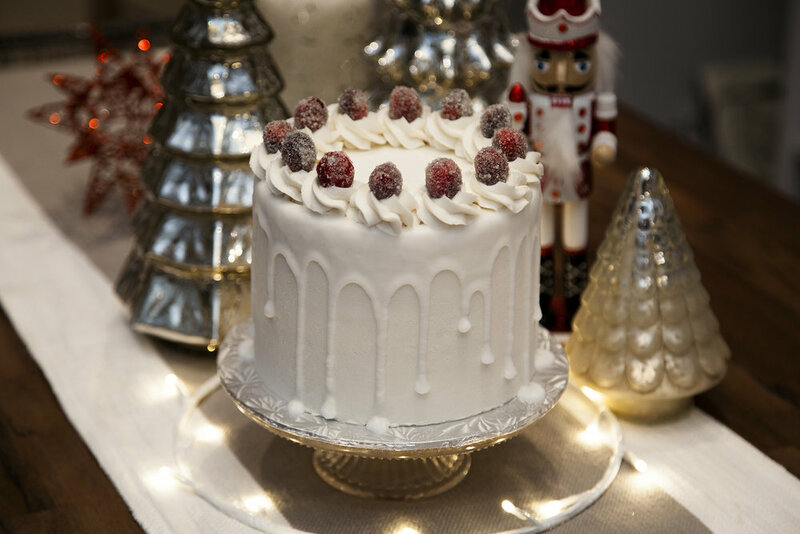 Frosted with a clementine cream cheese frosting and topped with homemade, candied cranberries. 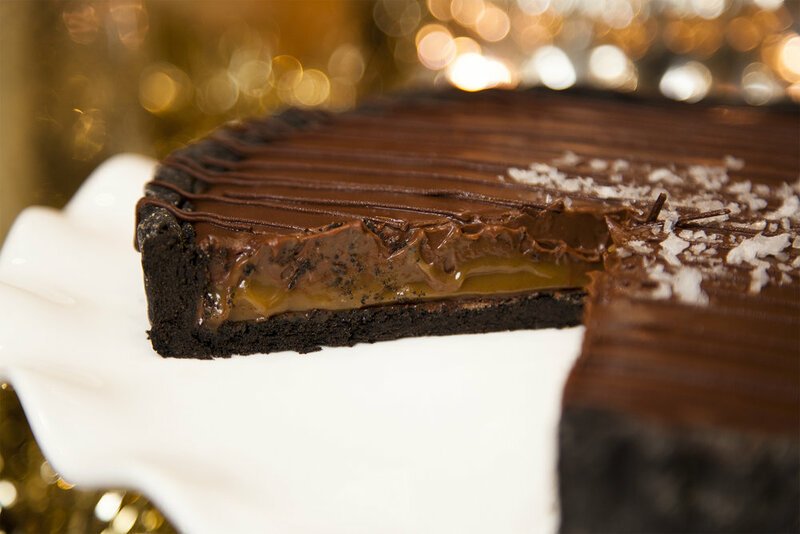 9.5” Salted Chocolate Ganache Bourbon Caramel Tart - This is possibly the most decadent product we’ve ever made! A tender black chocolate pastry filled with a thick layer of bourbon caramel and topped with a deliciously creamy chocolate ganache. Sprinkled with Maldon sea salt flakes. 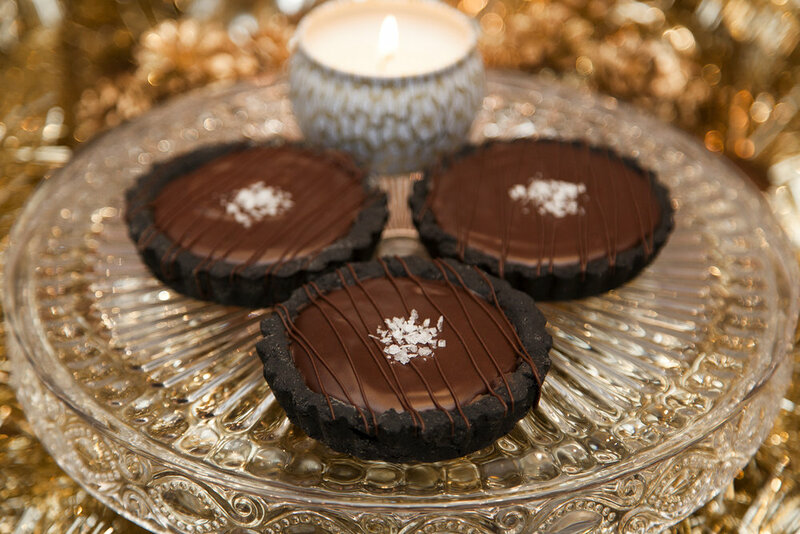 4” Salted Chocolate Ganache Bourbon Caramel Tart - The perfectly personal tart for you or a group. Tender black chocolate pastry filled with a thick layer of bourbon caramel and topped with a deliciously dark chocolate ganache. Sprinkled with Maldon sea salt flakes. 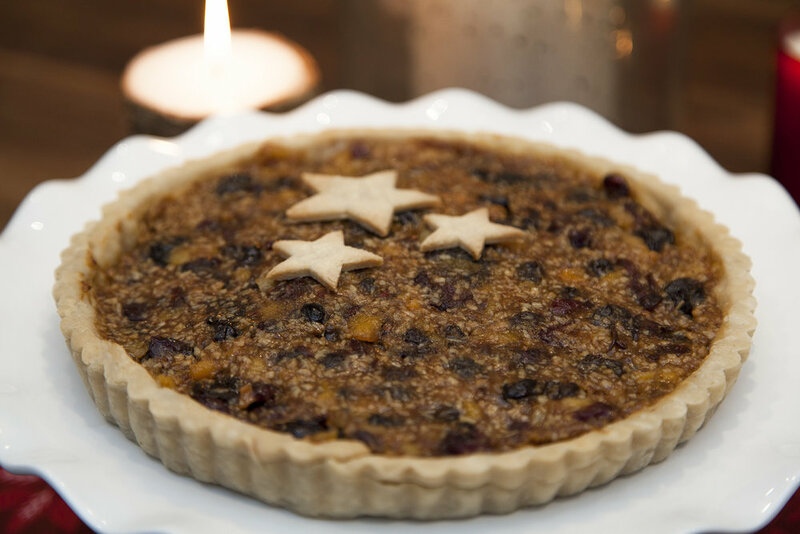 9.5” Christmas Tart (NO SUGAR ADDED) - If your sugar meter is nearing 100 this season, then consider this no added sugar, no compromise, modern take on minced meat pie. Chalk full of dried apricots, raisins, sour cherries and with hints of orange and rum essence, you’ll never know what you’re missing. 4” Christmas Tart (NO SUGAR ADDED) - Perfectly personal tarts for one or for a mixed dessert table! If your sugar meter is nearing 100 this season, then consider this no added sugar, no compromise, modern take on minced meat pie. Chalk full of dried apricots, raisins, sour cherries and with hints of orange and rum essence, you’ll never know what you’re missing. 6” Egg Nog & Caramel Cheesecake - So, so, good - I can't say it enough how good this thing is. With every single bite you will literally say OMG out loud. A spicy, rum infused, to die for cream cheese cake, baked on top of our ginger cookie crumble base, and topped with Bunner's creamy caramel. The textures, the taste, everyone back off, this is mine! Santa Baby Cookies - Santa Baby, hurry down the chimney tonight.. nom nom nom…. A Bunner's tradition and the perfect cookie to leave out for Santa on Christmas Eve! A chocolate peppermint cookie filled with a dolop of peppermint frosting and covered with a layer of thick chocolate - topped with crushed candy cane! Christmas Morning Muffins - Wake up on Christmas morning to a delicious treat packed full of seasonal goodness with your coffee. Pumpkin seeds, dried apricots, cranberries, sour cherries and raisins - infused with rum and drizzled with vanilla glaze! Gingerbread Peeps - Warm & spicy! 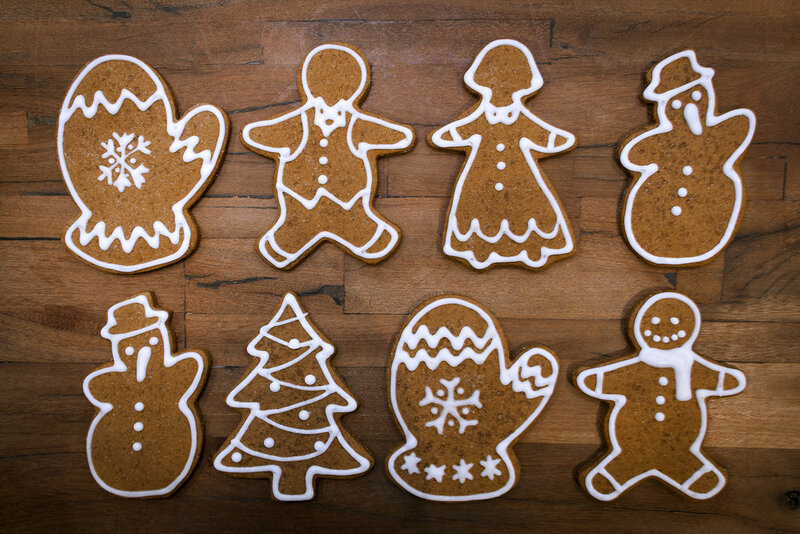 Beautifully decorated classic gingerbread cookies for all the good boys and girls of the world who made the ‘nice’ list. Peppermint White Chocolate Popcorn w/ Crushed Candy Cane - Stuff those stockings with the kind of nourishment needed to get you through the long haul of opening all those gifts on Xmas Day! Popcorn drizzled with peppermint white chocolate and sprinkled with crushed candy canes. It’s what elves eat! Sponge Toffee Lumps of Coal - Getting a lump of coal in your stocking just got a whole lot better. Homemade sponge toffee chunks dipped in tempered chocolate and wrapped up in a perfectly giftable, stocking stuffable, ribbon-tied baggie! Candy Cane Chocolate Bark - Tempered chocolate topped with crushed candy cane and wrapped in a stocking stuffable, ribbon-tied bag. Cranberry Clementine Cupcake - Whole cranberries cake center-filled with a delightful clementine curd & frosted with a clementine cream cheese frosting. Topped with a homemade, candied cranberry! Nanaimo Cupcake - Chocolate meets butter meets coconut meets rich, creamy custard meets ganache meets mouth... OMG! Apple Cranberry Crisp - A universally loved classic Christmas dessert! Oven baked spicy apples and whole cranberries with a crispy oat crumble on top. Depending on your requirements, we offer this crisp in two convenient size options! Hungry Bun Holiday Meal - Retro vibes elevated to 2018 expectations, the Holiday Hungry Bun is the one stop shop for everything Christmas! Garlic mashed potatoes and ‘turkey’ stips simmering in gravy, oven baked stuffing, mixed harvest vegetables (brussel sprouts, button mushrooms, squash, carrot and corn), and Bunner’s very own apple cranberry crisp - it’s everything you need to satisfy the hungriest of Buns! SOY FREE OPTION - Same as above, but no soy ‘chicken’ strips and twice the roasted veggies! Please specify in the selection field in our online store. Oven Baked Stuffing - Bunner’s from-scratch, oven baked stuffing is so delish you may need to buy an extra one for all the bites you’ll sneak before the big meal is served. Made using our very own GF bread, homemade veggie stock, carrots, celery, onions and mushrooms - it’s the perfect compliment to your Christmas spread.